Manila, Philippines - May 2014 nursing licensure exam (NLE) results are now out online today, June 27, 2014. 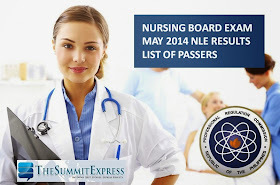 According to the Professional Regulation Commission (PRC), a total of 11,225 out of 29,188 passed the NLE given on May 25-26, 2014 in different testing centers nationwide. The complete list of passers in alphabetical order (M-Z) is now available on this webpage.